We are very happy to begin new spring semester 2018/19 at AHE! Students from Portugal, Spain, Italy, Turkey, India and Latvia arrived in Lodz to spend their Erasmus+ studies here. The Introduction Day was combined with Fat Thursday, so that students could get to know Polish tradition and try out some delicious doughnuts! We are happy to inform that our first Erasmus+ trainees have finished their mobility period at AHE successfuly! Thank you to Hulya Erez from Turkey and Timo Rinker from Germany for the effort they put in this internship! Students conducted their traineeship in International Departments of AHE. “It was amazing experince to do Erasmus+ intership at AHE in Lodz. I had a lot of chances to improve myself in my field. Also, I had oppturnities to get communication with international students and staff working in AHE. They were really friendly and helpful every time during my internship. By the way, the city is so attractive that you can find a lot of places to see around. When you come here, just live your life”. We are happy to announce the official begginig of 2018/2019 winter semester in AHE! The Introduction week took place for both Erasmus+ and International students. AHE is going to host over 200 students coming from Spain, Portugal, Turkey, Italy, Belarus ,Ukraine, Nigeria, Tunisia, Kazakhstan and many more countries from all over the World. Students played some icebreakers games to get to know each better and participated in Light Move festival, which is organized in Lodz every year. They had opportunity to see the shows with colorful lights in the city centre of Lodz. The most interesting part was the city game that students played to discover the most important places in Lodz. All of us had a lot fun with this activity! For the end of the Introduction week, the Inauguration of Academic Year took place. International and Erasmus+ students celebrated the Inauguration in traditional togas and birettas! Mr Remzi Tufecki from our partner University Abant Izzet Baysal in Bolu, Turkey has visited AHE under the auspieces of Erasmus+ Programme. He met with the students of English studies, the Deputy Dean of English studies Olga Majchrzak, the lecturer of AHE Mr Marcin Jaźwiec and the Erasmus+ mobility Coordintor Ms Agnieszka Laskowska. Mr Tufecki conducted classes on the following topics: Learning in cultural context and Language as an international tool. Thank you for this highly informative meeting! Academic Year 2017/18 in AHE has started! With the end of September we welcomed 25 students from Spain, Portugal and Turkey who will spend one semster or full year studying in AHE. We believe this is going to be an unforgetable adventure! 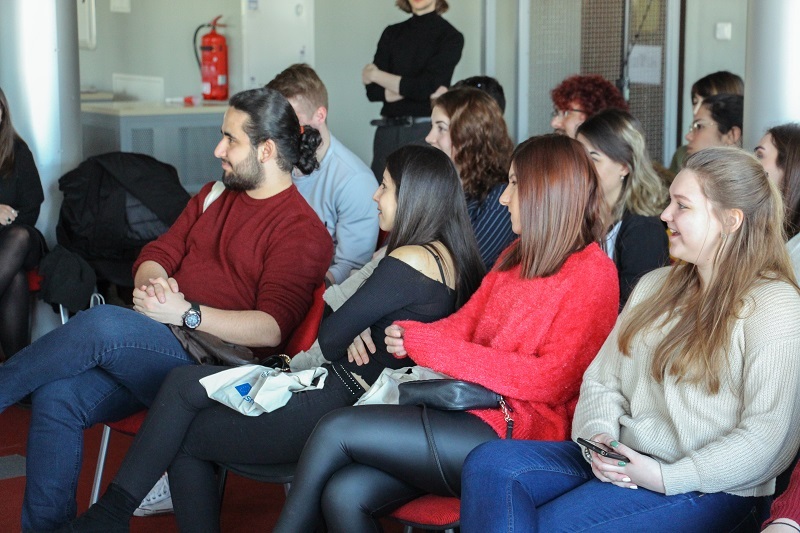 Last Monday, March 3rd at our University took place an Introduction Day for the Erasmus+ Program students. This fall, we host students from Portugal and Spain. Welcome to AHE and good luck! We hope you’ll have good time in Poland!